Make Great North Road great again! Great North Road: so called because, once upon a time before the Harbour Bridge, it was the main route northward out of Auckland (a counterpart to the Great South Road). Generally, however, GNR meanders mostly westward. From its beginnings at Karangahape Road, you can feel its origins as a straight old tramline street along the ridge. This broad multimodal boulevard served and boosted the growth of the new European Auckland – and because of its gentle gradient, it was always a favourite of cyclists too. And then of course we went and ripped out the trams, reappointed it as four lanes of traffic and a wide median, and turned it over to cars driving to far-away suburbs and shopping malls. As if on cue, a lot of GNR’s old buildings and people-focussed retail disappeared, to be replaced with commercial properties (and many, many car yards). People on bikes still ride GNR because it’s a key route to town, and relatively flat – if you time it right, the bus lanes can be quite accommodating – but it’s really not the most bike-friendly place. That’s about to change. Auckland Transport, as part of the planned Inner West works (see our blog here on the public responses, and our overview of the routes now under consultation) – is now proposing to add bike lanes on Great North Road, which was one of the most in-demand locations in the previous consultation round (look at this map!). The result: approximately 1.5km of bike lanes, from the Grey Lynn shops all the way to town, where they’ll hook into the future K Road cycle lanes. Sweet as. No question: we want a bikeway here, and there’s a chance to do something really great. So how do AT’s plans look? Ah. That’s a wee bit… wafty. Physical or painted buffer? Which is it? We asked: it seems the ambiguous language is because the specific type of physical buffer hasn’t been decided yet, and there may be the odd short section – likely near Grey Lynn Town Centre – where a full divider isn’t doable. But we do have confirmation from the top that physical buffers are included. FEEDBACK SHORTCUT #1: Ask for serious dividers! How about Triangle Road style? A lengthwise “rubber wheelstop”? By the way – if this strikes you as still looking a bit temporary, it is. To save on money and provide more ‘bikeway for the buck’, AT won’t be relocating kerblines (unlike on K Road, where the cycleway will get a more permanent design). This doesn’t really worry us – fast is good, if the result is good. And in a couple years or so, when the street comes up for its major renewal, there will be so many people on bikes using this route that it’ll be a no-brainer to add a proper Copenhagen lane or similar. AT provides firmer details here, with the plans showing some proposed designs for bus stops and how people on bikes will move through them. Click through for two key examples: the top image is for the busiest bus stops, and the bottom one for lower-volume bus stops (hmm, spot those vertical divider poles in the rendering!). We think these designs are pretty good. They’re new to Auckland – and they might take a while to grow on us – but they work well when designed well. The Netherlands has bus-bike combos that are so state of the art they make us cry, but how about a few decent UK examples to chew on, as a model for Auckland? This could be comparable to the ‘detour’ lanes proposed at busier GNR bus stops, though admittedly the bus island will be narrower at ~1.5m. Still, big enough for someone getting out of the bus not to directly step into the bike lane. A bit of attention and courtesy, and things should work out fine. Photo by Mark Strong. This is comparable to the lower-volume stops AT proposes, where the cycle lane will ramp up to a bus stop platform, and people on bikes will have to stop when a bus is there (or go around, either to the right on the road, or like the lady on her bike to the left. Giving way to pedestrians will be the key at these stops). Will all of these bus stop solutions be awesome and work brilliantly? Let’s be honest, probably not, at least not at first. There will likely be teething problems as people get used to them. We could overcome this by going ‘full Dutch’ from the get-go with more generous bypasses. In any case, we will work with AT to get the best outcome. The key point for feedback here is to let AT know that this is definitely the right direction. FEEDBACK SHORTCUT #2: Support the new bus stop designs, particularly the bypass ones! What about the Grey Lynn shops? Sadly, AT have decided that including this section would cause serious delays, and risk the project not happening in the short term. This may be related to a recent consultation, which proposed relocating a few bus stops and removing some parking spots, which caused some consternation amongst some residents and retailers. You can call it a worrying decision to leave this section out, to be resolved later. On the other hand, the project will proceed faster – and the very nature of the gap, as well as the constantly growing cycle numbers – will make the case this section needs to be fixed in the next stage after 2018. Also a bit more troublesome is the section around the bend into Grey Lynn Town Centre, at St Joseph’s Church near the public library. Even with some road widening planned, it’s not doable for the protected lane to continue through here on the westbound side of the road. Why? Because the buses swing out on the curve, and need extra road space. For those who prefer not to ride on the road through this section, you’ll have a shared footpath for a short section. You will also have noted that the Bond Street signals are shown as ‘details to come’, and that the K Road / Ponsonby Road intersection is ‘out of scope’. The Bond Street intersection will be included in this project (although AT is still considering the best way to do it), while the second intersection will come as part of the K Road project (later, but done by 2018!). Instead, for both intersections, we want AT to provide ‘hook turns‘. These let people on bikes stay on the left (in an extra space off to the left of the bike lane), and then cross to the right when the side street gets the green. Much safer than sitting in the painted green box in the middle of the road. FEEDBACK SHORTCUT #3: No to ‘advance stop boxes’ – yes to hook turns! A hook turn in the wild! (Well, in the Garden City – photo via the excellent Cycling in Christchurch blog). So, there we are. A massive improvement coming for this great road, completed by 2018 at the latest (and possibly even earlier, as GNR involves less work than other routes in the same consultation). Now it’s time to stand up in support. Add your feedback on the Great North Road bike lanes before October 21st. Please ensure the cycle lane is physically separated – with a solid, durable divider! 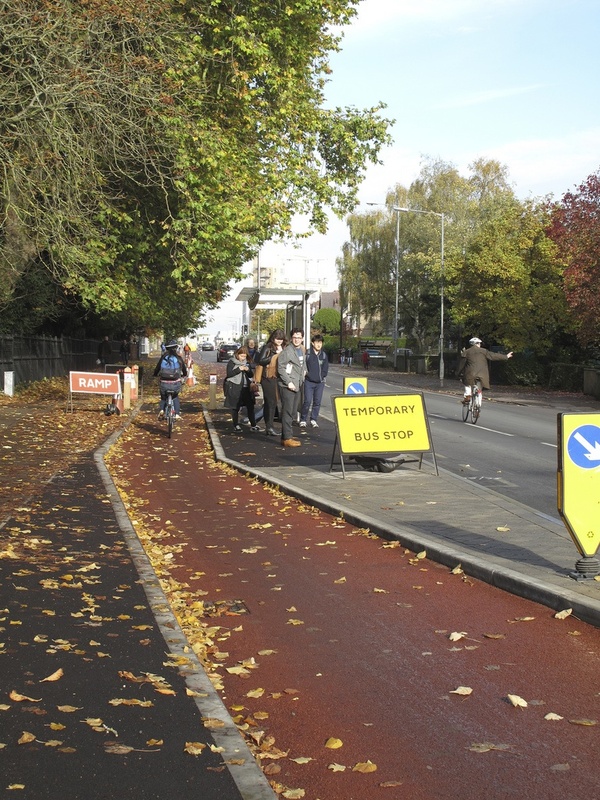 We like the bus stop cycle bypasses – please provide as many as you can, and as much space for them as possible. 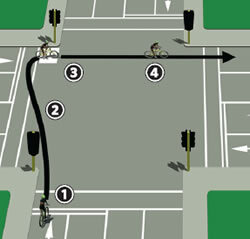 At intersections, please provide hook turns for safe right turns – we want this everyday movement to be stress-free. I take it you’ve seen the consultation for the GNR/Bond St intersection? Looks like huge improvements for pedestrian and cycle amenity and safety at this intersection!